In the past few months, more than 140,000 people received critical help through Nazarene disaster response efforts in countries around the world! When disasters struck, churches mobilized. Thanks to Nazarene Compassionate Ministries’ Greater Compassion Fund, they were able to respond immediately. They didn’t have to wait for us to raise support because it was already there. When you give and pray, YOU are part of Nazarene crisis response efforts. When the winds raged, the waters rose, and the ground shook, Nazarene churches were there. And in the days that followed, they were still there to walk alongside families and individuals on the road to recovery. After Hurricane Harvey, Nazarene churches in south Texas gave emergency relief to 22,000 people, as well as assistance with home repair. After massive, deadly floods in Bangladesh and India, Nazarene churches provided food aid to more than 60,000 individuals. 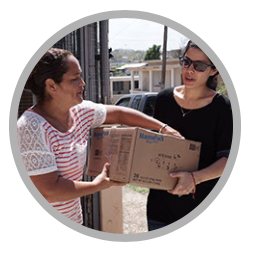 After Hurricane Maria, Nazarene churches provided aid to at thousands in Puerto Rico and Dominica. When mudslides devastated communities in Sierra Leone, local churches provided food and other supplies to 3,500 people. When a dengue fever outbreak hit Sri Lanka, more than 170 church volunteers took part in awareness campaigns and clean-up activities that reached more than 8,300 people. When earthquakes shook communities in Mexico, more than 420 Nazarene volunteers provided food, shelter, and medical care for 50,000 people. Local churches were able to respond to immediate needs through the support of the Greater Compassion Fund. Will you give today to ensure that help comes quickly in the coming year, too? Provide safety, stability, and hope to vulnerable children. Church of the Nazarene Canada 20 Regan Road, Unit 9 Brampton, Ontario L7A 1C3. Give through your local church or district, designating your gift to NCM Global Fund. Be sure to put Project 128418 in the Memo area. For any other country, give through your local church or district, designating your gift to NCM Greater Compassion Fund. Thanks for meeting urgent needs in Jesus’ name. This year, you can share your support with loved ones. If you give $100 or more to the Greater Compassion Fund by December 31, you’ll receive a set of notecards created by children who are part of NCM’s child sponsorship program. When you mail these cards to others, you’ll be sharing about the ways God is using compassionate ministries to transform lives.